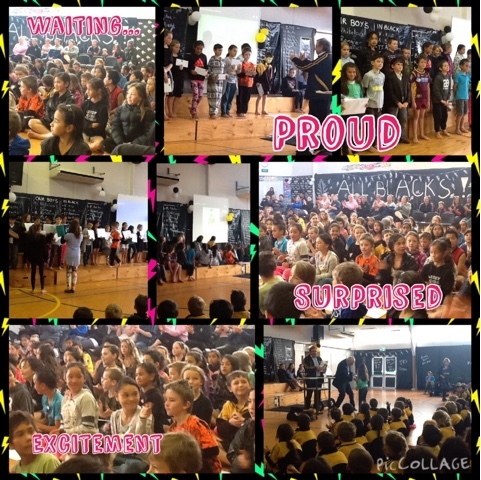 Thank you so much for joining us at our special assembly on the last day of term 4. I was so excited to see the students faces when they realised the special assembly was to celebrate their success in the Ministry of Educations 'Their Stories, Our Stories' World War 1 competition. Such a proud moment for us all. Here is the Presentation video of the room 6 students receiving there awards and prizes. Thank you to Miss Beattie for filming it for us and Miss Sherratt for taking photos. In Room 6 this year our focus is to 'Give it a go'. Each child could identify something they don't love doing and instead of avoiding that task, we have been encouring each other to give it a go... everyone has an area that they enjoy more than others and it doesn't matter if you're not the best at it as long as you give it go - this is something to be proud of. This attitude has overflowed into looking at things outside of the classroom and is how we came to enter our learning in this competition. "Give it a go or you'll never know!" Congratulations Room 6! Your 'Give it a go' approach certainly paid off - you should be so proud of your success in the World War 1 National competition. Thank you Mrs Bava for all you do for our tamariki!